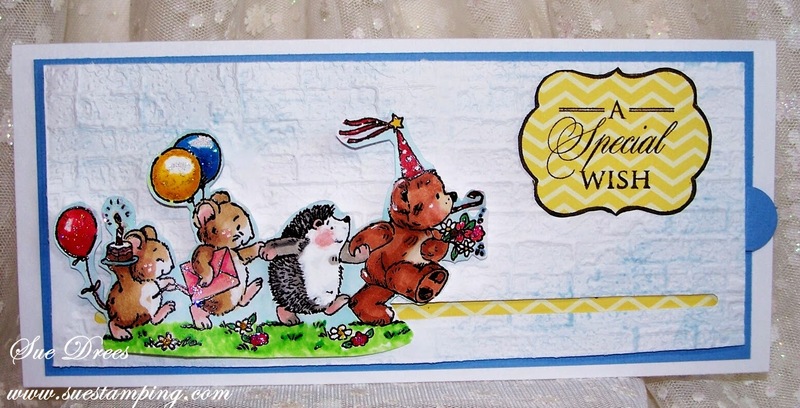 Sue's Rubber Stamping Adventures: BSS MONDAY IDEA - A Slider Card - Are we there Yet. BSS MONDAY IDEA - A Slider Card - Are we there Yet. Today's idea is a Slider Card. Had not made one of these in awhile. While shopping at BSS recently, Sharon showed me a new die that makes the slit or channel that you want to slide, and the pull tab and sliding mechanism. on their website with step by step instructions. See link below. Click the images to see them larger for detail. with the CutUps Slider die 057 by The cat's Pajamas. so your insert with your message slides through the end opening easily. out, your image will ride along the slit. Finish off your card by attaching the pull tab to your slider paper. Wonderful card Sue, I love the cute image and such a fantastic design. o what a fun and gorgeous card Sue. Sue this is a cute slider card. I have to admit I have never tried one, but I may if I get a minute after reading your instructions. This is a super fun, cheery card. Enjoy your day. WONDERFUL Sue!!! Great instructions!! I just love your sweet little band of merry makers...so beautifully coloured and displayed!! Delightful slider card with a lovely fun image and wonderfully coloured!Thanks for the instructions, it has been years since I made one!